how rare is this set? Anyway, what is the frequency that this happens compared to a regular set? This is probably the most confusing group of errors ever created and it's because there are two different errors and they both involve "white letters." They're both referred to as "white letter variation" but they're both different. I'll break it all down here in this post. Let's start with the most difficult to find. The error is that some of the silver signature cards had their names on the front printed in white instead of the silver. If your card does not have a facsimile signature on the front it is not an error. All FF cards can be found with either of these variations. The variations are referred to as the Silver Sig White Letter variation and the White Letter variation. Obviously, this whole thing is a recipe for mass confusion. It took me a hell of a time before I was able to sort it all out myself. I hope this helps and if there are any questions I'll do my best to answer them. Last edited by HasselhoffsCheeseburger; 06-05-2018 at 10:30 AM. The variation he is showing seems to be the white bar variation on the bottom of the front of Michael Jordan. What about the FF cards? Is there a third variation that I don't know about? And do the silver signature white letters come with both backs? 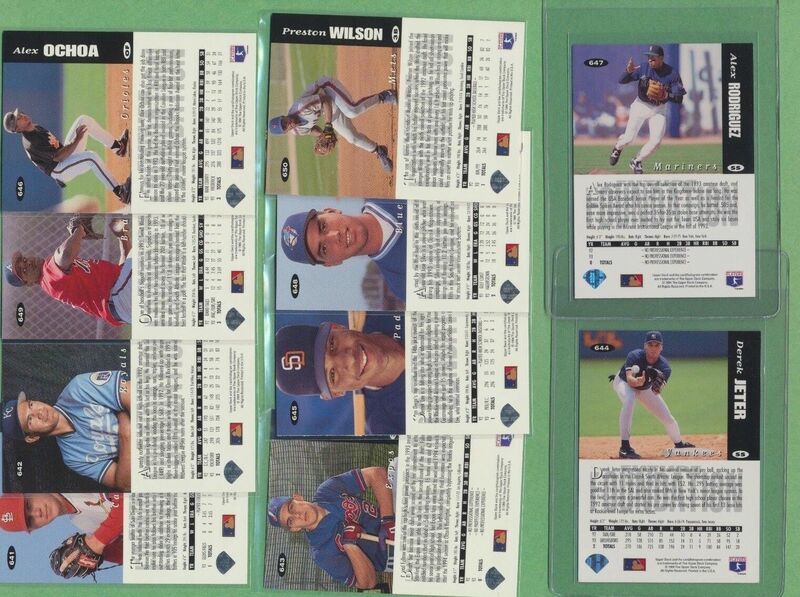 The 1994 Upper Deck Collector’s Choice product has been a fun set to collect. The set has a Jeter error, Arod Rookie error and Jordan errors cards on top of the limited silver and gold parallels of the base cards. I got into them a few years back. I’ve opened about 15-20 factory sets and purchased some of the different errors.I bought the factory sets because I thought that was the best shot at getting some of the gold cards. The best gold card I’ve pulled was a Griffey Jr. Up Close and Petsonal card. Most of the other gold cards were commons. The majority of the sets I’ve opened have also had some pretty serious issues with the cards being clumped together. There is some info out there on the different errors that are available within the set if you dig a little. The tan border cards(the Jordan pictured) are exclusive to the factory sets I believe. 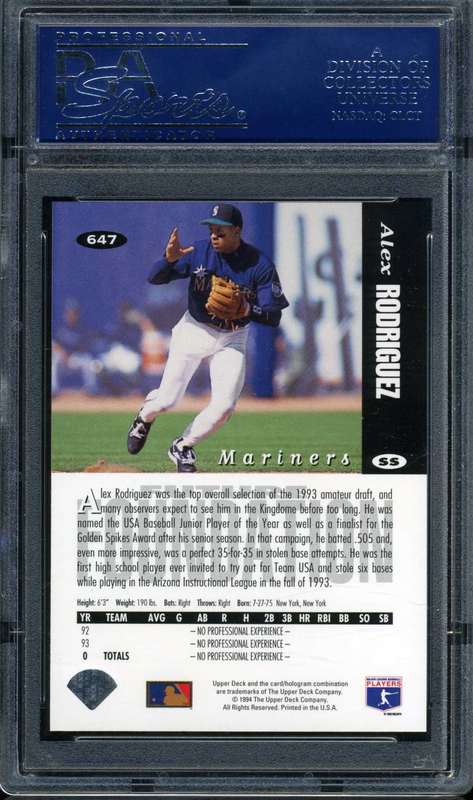 In my experience the white letter version of the base Arod card comes along with the factory sets that also contained the up close and personal cards with the tan borders. I think 4 or 5 of the sets I’ve opened had the white letter Arod and tan borders cards. With the small sample size I’m not sure that’s close to the true percent of factory sets that come that way, but that’s what I’ve seen. Also, in my experience the Jeter base cards all come in with a white letter D on the back. I don’t think the there is a grey version of the D on the back of the Jeter unless it’s a silver signature card. I’m not sure where the Jeter white letter base card designation came from other than the Arod has a white version and a grey version and the confusion is based on this. The silver signature White letter variations seem to be pretty rare. I’m not sure if they are more rare than the gold versions but they seem to have a similar scarcity and may be Arod’s rarest rookie and Jeter’s rarest 2nd year card. On top of that there is a Jordan silver signature card with a black border error. The bottom border (lower 20% of card) is black on one and white on the other. The top border is black on both of them. Omg cant believe I missed that thanks. I usually do good with the kids menus. Interesting. I wonder then if the ARod white letter is even the variation. If the Jeters are all white and the silver sigs are the only ones with the grey enlarged D then it makes sense that the grey enlarged first letter on the back was intended to be used for the silver signature cards. Somehow, it got put on the back of some of ARod's base cards? Or somehow it got put on the back of most of ARod's base cards? I'll have to dig through my boxes. I ripped a box of packs and if my memory serves me I pulled other FF cards with the white letter on the back. I just can't remember if there were others that had the grey letter on the back. My thanks to Greg and Hatorade as you two forced me to abandon the lousy research I was basing my conclusions off of and dig deeper. That's what they've got catalogued to date. They mention that there are variations for the Rookie Class subset but don't elaborate on what they are. Does anyone know anything about these? Could and would are two completely different things. I’ve seen more then a few time where a shortstop should be in a particular place and they are not. Jeter has no reason to be where he was when he was doing what he did. what the ratio for this set to the regular? also any idea on value? Last edited by lowpopper; 06-07-2018 at 01:37 PM. Greg, what variation are you referring to when you show the front of the Future Foundation cards? Again, the white letter is only an error if the card is a Silver Signature version on the front. Yours are the base cards, so they are not the error version. Am I alone in thinking that the white letter on the back should not be recognized as the variation and, instead, it's the grey letter that should be considered the variation? Grey letters on the back occur on ALL silver signature cards. White letters on the back occur on ALL regular base. The odd man out are the handful of regular base that have the grey letters on the back. It should be the grey (or, more accurately, silver) letter variation. I think for their base cards the most common form is the card with a grey/silver letter, but some of the factory sets contain the cards that match the other cards from the subset with the white letters. The only packs I've opened of 94 CC was when I was I kid back around 1994, so I'm not 100% on that though. Strangely enough, the the silver signature white letter version of the Arod has a grey/silver A on the back and the Jeter silver signature white letter cards have the white D. I'm wondering if the other cards you listed come with the grey/silver letter on the back of the silver signature white letters. I have a few of the other guys in silver signature white letter, so I'll try to dig them up and check. That very well may be. In fact, we may be looking at something that turns out to be nothing. At this point, are any of the known base cards particularly rare? Doesn't seem so at all. 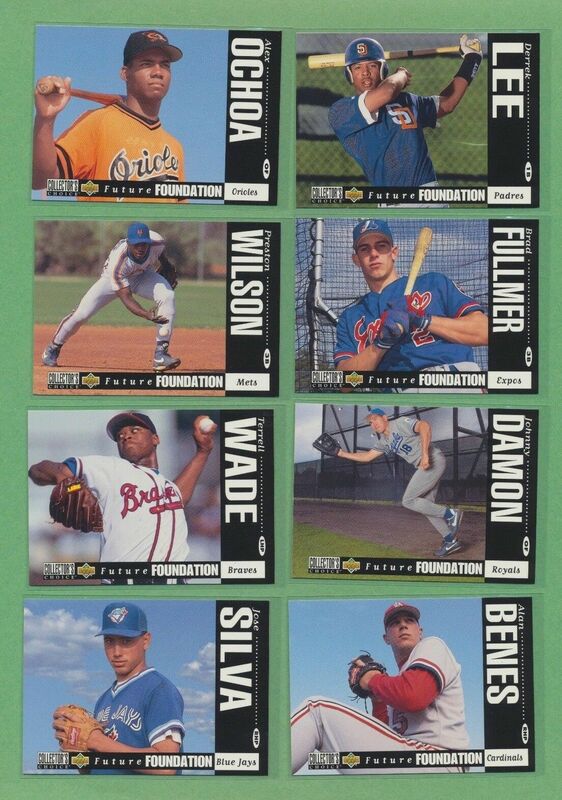 • Silver Letter on Back -- Damon, Fulmer, Lee, Ochoa, Rodriguez, Wilson. All found easily enough in wax packs. I pulled 4 from the one box I opened. 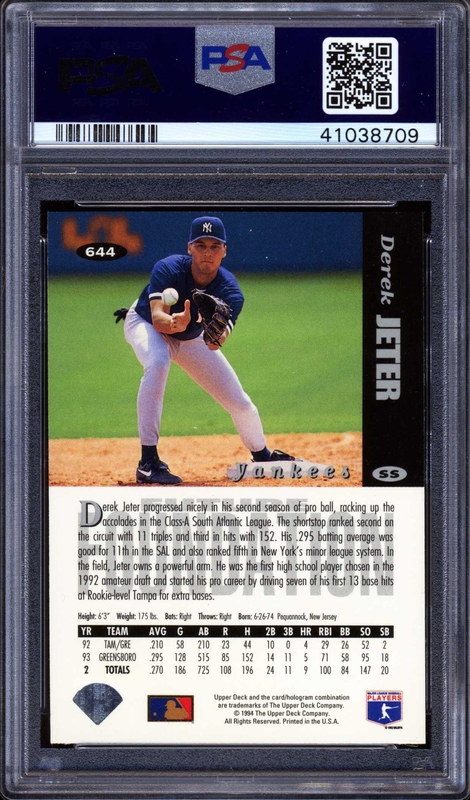 • Pack-Issued White Letter -- All the players beside the above, not difficult to find, every Jeter has this. Pulled these from the same box that I pulled the above silver letters. • Silver Letter Players with White Letters -- Damon, Fulmer, Lee, Ochoa, Rodriguez, and Wilson but instead of the silver letter that is found in packs they have the white letter and are found in factory sets. That's it for the regular base cards. I don't believe there's been a single example of a base card deviating from those categories. If that turns out to be the case, we technically have variations but none of them would carry much of a premium as they're all somewhat readily available in existing product. make a differentiation. Is this just an oversight? Those slabs are referring to the white letter on the back, not the white letters on the front. The PSA slab that doesn't mention it is just a card that was graded before PSA acknowledged the variation. 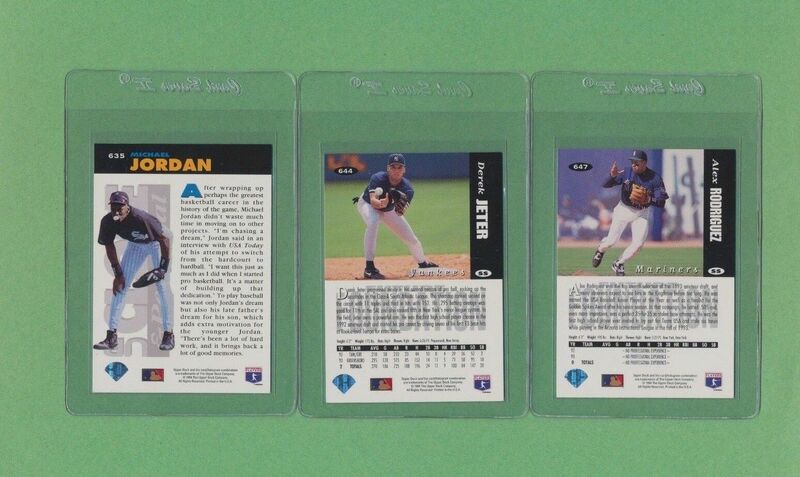 All three cards in those scans are exactly the same (except for their condition) and are the only known version of Jeter base card for the set. What we're slowly piecing together in this thread is that, as it turns out, there is no variation for some of these base cards (like Jeter) and for the base cards that do have a variation there is no rarity attached and hence no value premium applied. All future foundation silver signature cards can be found with white lettering on front (much scarcer) instead of the normal silver lettering on front. As mentioned in this thread, only a handful of the FF cards have both a white and silver 1st letter of text on back variation. 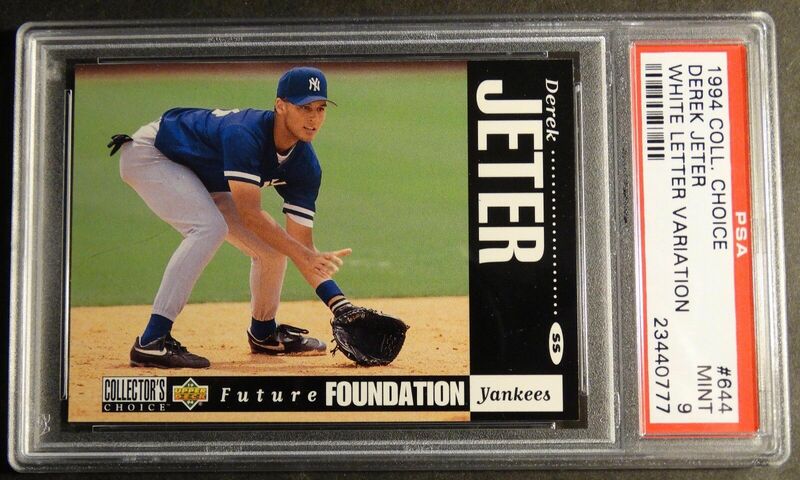 For example, ALL base issue Derek Jeter cards have the white 1st letter on back, NO GRAY VERSION EXISTS.